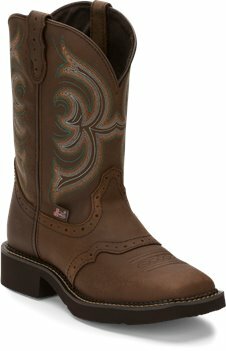 Run the world in the 11-inch tall Inji Brown Justin Gypsy™ Women's cowboy boot. 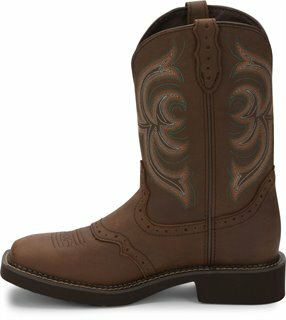 Its casual and comfortable with a distressed hazel brown leather exterior accented by a green, coral, and cream stitch pattern and perforated saddle vamp. Features such as the square toe and J-Flex Flexible Comfort System® insole with removable orthotic inserts keep this boot functional and comfortable. You're guaranteed cushion and support whether working, riding, or playing.